Wimbledon 1980: Wooden Racquets, Short Shorts And The Ultimate Showdown On July 5, 1980, the stage was set for the greatest rivalry in tennis: Iceman Björn Borg versus hothead John McEnroe. The match lasted four hours — and was one of the best in Wimbledon history. Serena Williams won her 21st Grand Slam title at Wimbledon on Saturday, defeating Garbine Muguruza of Spain. Sunday promises the long-awaited rematch between defending champ Novak Djokovic and Roger Federer, who's won the tournament seven times already himself. The rivalry between Djokovic and Federer is one of the greatest in modern tennis, but arguably, it's not the greatest all-time. Many would say that honor actually goes to a matchup 35 years ago — back in the era of wooden racquets, headbands, long socks and short shorts. Wimbledon 1980 was the ultimate showdown. There was Björn Borg, a rock star, the dreamy Swede with flowing blond hair. Borg was the four-time defending Wimbledon champion. Then, there was the scrappy New Yorker named John McEnroe, a 21-year-old tennis prodigy known for his temper. Sweden's Björn Borg was the favorite in the 1980 Wimbledon match. He was nicknamed "Iceman" for his cool, calm demeanor. "He had such a beautiful game, but he was wound as tight as a drum all the time out there," says sports photographer Walter Iooss. "And at any second, you waited for him: One line call, and he just — he'd flip out." Borg and McEnroe were complete opposites. They were dubbed fire versus ice. 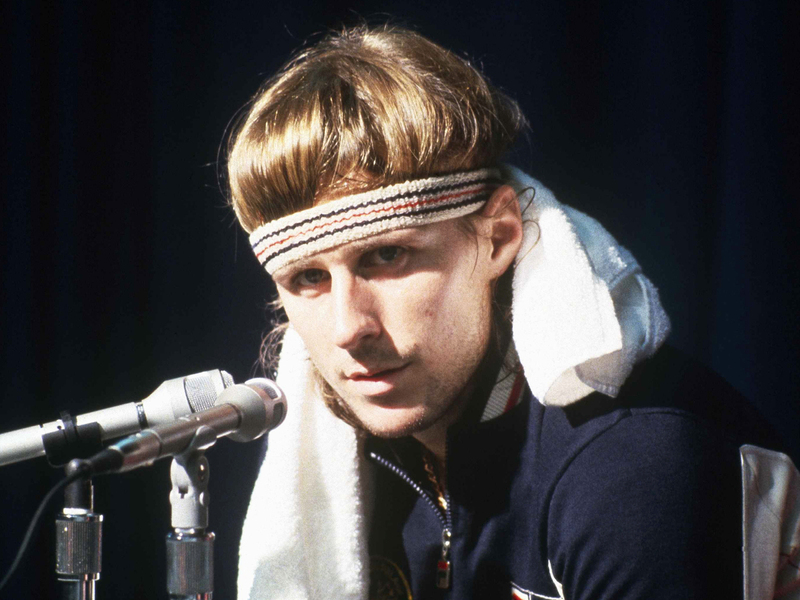 While Borg was the crowd favorite, the British tabloids pegged McEnroe as the bad guy. 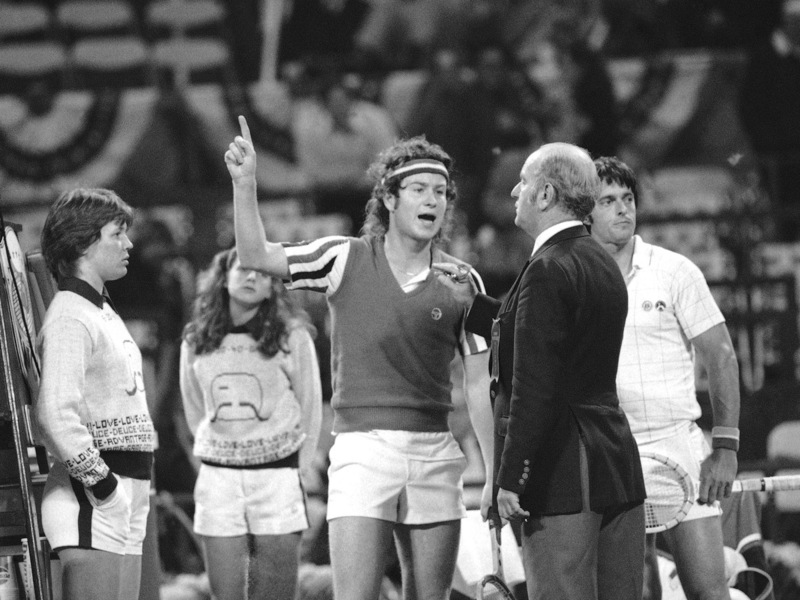 John McEnroe, known for his short temper, gestures angrily at umpire Joey Lessing during a match in New York in May 1980. "People weren't very crazy about him. They booed him when he came onto the court," says retired NBC sportscaster Bud Collins. He was calling the match that day at Wimbledon, 35 years ago. "And of course Borg was the gentleman, the stoic Swede, and they played this magical match which went on and on and on." McEnroe easily took the first set, but Borg came back strong, winning two sets in a row. McEnroe wasn't one to quit, though. He fought to stay alive in the fourth set, which led to what felt like a never-ending tiebreaker. Incredibly, McEnroe stayed in, and the match continued. "They just went at it as though they were the only players on earth," Collins says. "It was a brawl. It was the best thing comparable to a heavyweight title fight. And certainly, they were the two heavyweights of tennis." Finally, Borg and McEnroe entered the fifth and final set. Whichever player won this set would win it all. "One guy would make a tremendous shot and that would tie it up. And another guy would make another tremendous shot and take the advantage," Collins says. "Advantage, deuce, advantage, deuce, advantage, deuce. I was having a little trouble keeping score." Meanwhile, down at the sidelines, Iooss was waiting for the match point. "In an event like that, you always think of one thing going in, which is the last moment," Iooss says. "What's going to happen when the match ends? When McEnroe or Borg rejoices?" In the end, it was Borg's flawless backhand that clenched it. The crowd erupted, and Iooss captured the moment: Björn Borg sliding on the grass, arms extended, head back — the look of pure joy. The stoic Swede, not so stoic in the moment, had won his fifth straight Wimbledon. 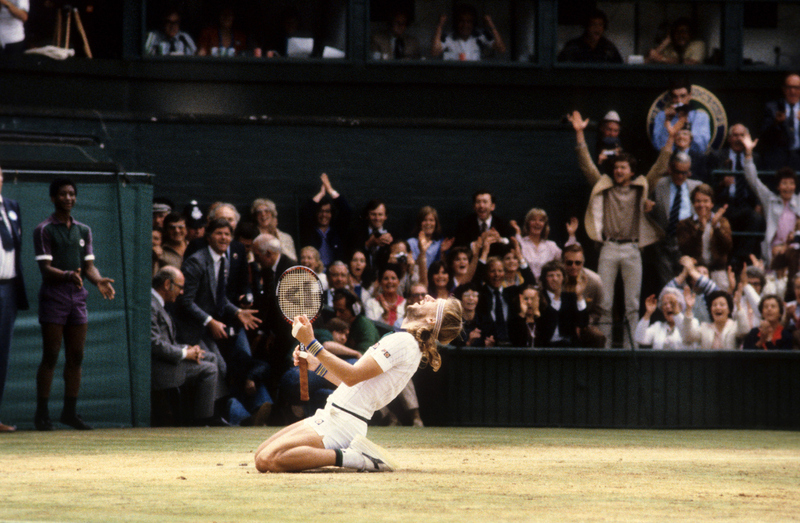 Photographer Walter Iooss captured Björn Borg's celebration after winning the match at Wimbledon in 1980. "You see a match like that maybe once in your life," Iooss says. "I was lucky to be there." On the other side of the net, John McEnroe was on the grass sprawled out, face-down with the look of pure defeat. After nearly four hours, the historic brawl at Centre Court was over. 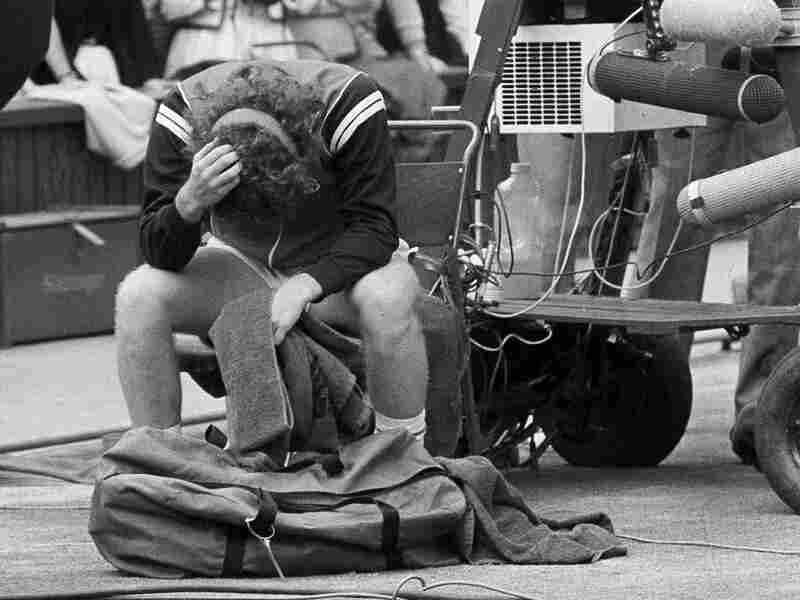 John McEnroe holds his head in his hands after being beaten by Sweden's Björn Borg. "It was perfect," Iooss says. "Yankees and Red Sox, Ali and Frazier, Borg and McEnroe. These are great rivalries, and rivalries make each side better. You see a match like that maybe once in your life, so I was lucky to be there." "I just said to myself, and I think many others did, 'This is the greatest tennis match I've ever seen,' " Collins says. "And I think if you asked Borg and McEnroe, they would both say the same." McEnroe may have lost, but he gained a lot of respect. Now, he's a fixture at Wimbledon. He's there this weekend — this time, in the stands where crowds cheer him on.